Street Fighter V: Arcade Edition is about to get more stylish. 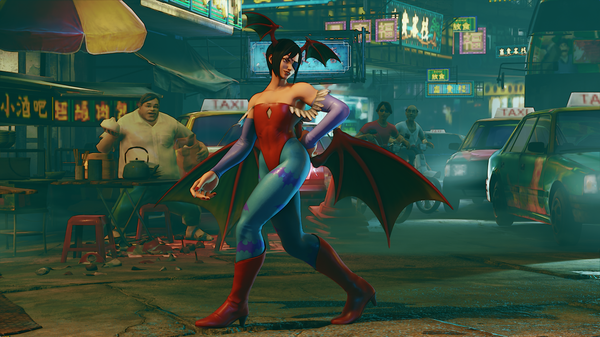 Capcom announced today that Street Fighter V Darkstalkers DLC costumes are on the way for three characters: Menat, Juri, and Urien. Menat will wear a Khaibit costume, while Juri and Urien will take inspiration from Lilith and Donovan, respectively. Each costume will cost $3.99, and will be released April 3, 2018. Street Fighter V: Arcade Edition contains all of the Season 1 and 2 DLC characters. It also includes an Arcade Mode, Extra Battle Mode, and new V-Triggers for the entire roster. It’ll be available as a free update for existing owners (although they won’t get DLC they don’t own) or can be purchased for $39.99. Street Fighter V: Arcade Mode is available now for PlayStation 4 and PC.